A high-quality, reliable automatic knife that can handle almost any job it’s called on to do is nearly worth its weight in gold to a hunter. Most hunters need a knife that can be carried easily on a belt so that it’s handy whenever it’s needed. The blade and handle should be able to stand up to the work you’ll use it for in hunting. There are several different criteria you should consider before purchasing a knife that you’ll depend on in ways you might never have imagined. An automatic knife blade stays in the closed position inside the knife’s handle until a device on the handle, such as a button or a lever, is pressed, extending the knife blade to the full open position. The automatic features built into the knife prevent the blade from opening unexpectedly. Even when extended, the automatic knife blade is small enough to carry in a pocket or on a belt pouch conveniently and comfortably. Most automatic knives, such as the Boker Kalashnikov, usually extend from three to seven inches from the handle and work well as a tool in cutting game that must be dressed before it can be removed from the field. A fixed blade knife, on the other hand, is a larger tool. The knife blade can extend between six and twelve inches, although most fixed-blade hunting knives tend to have shorter rather than longer blades. While fixed blade knives have a reputation for standing up to the harsh demands of hunting, they can be inconvenient and sometimes dangerous to carry. A good automatic hunting knife needs to be durable enough to meet the demands you’ll place on it while hunting. Safety and usefulness are the primary characteristics the knife should possess. The Piranha Bodyguard automatic knife, for instance, features a bayonet-style serrated blade sharpened on both sides, which makes it ideal for skinning game. Knives such as the Piranha automatic knives include comfortable handles that add to their usefulness in the field. After you’ve decided on the right automatic knife for your hunting needs, you’ll need to consider which kind of point your knife should have. The three basic types of knife points used by hunters are the clip point, the drop point and the hybrid point. Most automatic knives, such as Boker automatic knives, use the clip point that is ideal for cutting preciser areas of your game during field dressing. The handle of the knife you choose is also very important. Many hunting knives have wood or bone handles, which look very nice but can be very cold in the hands on those early deep winter mornings. A synthetic handle, part of the construction of most automatic knives, provides warmth and a sure grip when it’s needed most. Dustin Williams is an outdoor adventurer who loves spending time out in the wilderness. One tool he recommends when outdoors, is a good knife. 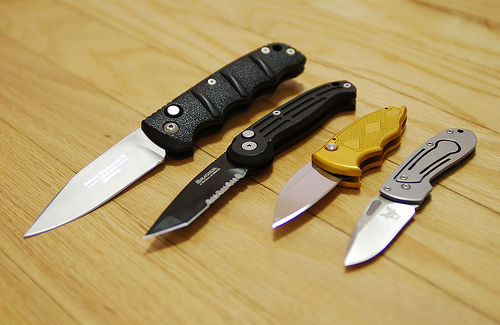 Dustin recommends vising an automatic knife retailer like BladeOps to get more information on the Boker Kalashnikov and Piranha Bodyguard knives.